Established in 2009, the AESTHETICS PRACTITIONERS ADVISORY NETWORK (APAN) is Australia’s fastest growing member-based professional organisation in the Australian aesthetics industry. APAN represents and pursues the interests of practitioners in aesthetics, dermal therapies, cosmetic nursing and cosmetic tattooist. We define professional standards and support the development of educational qualifications that protect the integrity of the profession and the safety of the consumer. APAN stages educational events and workshops that enhance and improve professional skills, best practice and fosters professionalism, high standards and integrity. 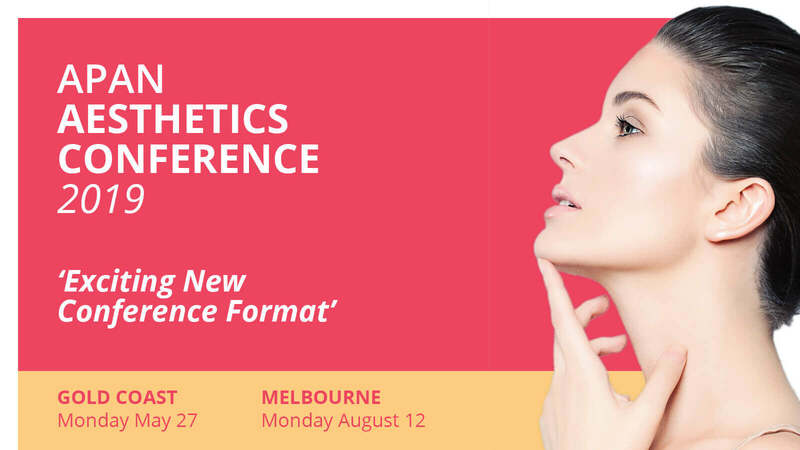 Pre-register for the 2019 Aesthetics Conferences. May and August. APAN maintains industry relevance through the various feedback mechanisms that ensure it remains in touch with the changing needs of its members and the industry. I recognise APAN as the leading and most credible standards body in the Beauty industry. Having APAN’s support is so valuable to my business and a comfort and reassurance to me. They keep me abreast of the ever-expanding developments in the industry. If I have a problem I can reach a leading expert any time – they are just a phone call away and I know I will receive unbiased, accurate and credible information that is well researched. I have found them very efficient and professional. Their website has a wealth of information and is constantly updated. I am proud to be part of this professional body and find their support and resources invaluable to my business. I cannot believe why anyone in business would not belong to APAN and receive the backing and support that can ensure their progress. I was going through a major business crisis and it was recommended to me to phone APAN to join and access their mentoring and consulting services. Within half an hour of speaking with Tina Viney I was given immediate expert advice and gained clarity on how to address the issue at hand. Tina presented me with some incredible advice and options that allowed me to solve my issue straight away. To think we can access on industry leader of her calibre for a small yearly fee is amazing. For her wealth of knowledge and expertise I expected to be paying my yearly fee as an hourly rate. I am sold on the value of my membership with APAN. I had spent thousands of dollars getting legal advice to address my staffing issues not to mention the stress. Then someone told me about APAN and I spoke to an expert there and immediately realised that I could have access to top information and expert advice so quickly and easily and at a very reasonable rate of just joining as a member. Now when I have a query or a question, I just flick an email to APAN and within the hour I receive expert industry advice or legal advice from their solicitors it’s amazing. As a professional I know my information needs to be accurate and credible. Through APAN I have access to not only the best but I also get my needs met fast! Joining was the best decision I ever made. My association with APAN is one that I greatly value. It is exciting to be part of a great organization and a large professional network that can offer me expert support and credible advice. APAN has brought a new level of service that we have not experienced before and they have shown great integrity within the industry. Their commitment and passion for the good of the industry is inspirational. Whenever I have reached out to them they have always been very positive and resourceful. I have also found them very generous in giving above my expectations and helping me achieve my goals. My membership to APAN has been invaluable in keeping me abreast of what is happening in the industry. The comprehensive website also helps me gain in a snapshot what is happening in the industry. The journal APJ of course I consider is world-class and always full of quality, well-researched education that allows me to determine my choices. You can always rely on it for quality, credible and accurate information. Knowing that I have access to industry experts is also a great advantage and one that I turn to when I need help.